Hailing from Austin, Texas, The Lucky Strikes are a product of the very articulate music community that gave birth to them. Their lounge/swing style is refreshingly new, while still paying the proper respect to the past. 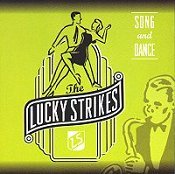 One of the best swing bands in the current 'revival,' The Lucky Strikes sophomore album proves the band is the perfect compliment to front man Craig Marshall's stellar songwriting abilities. Packed with fourteen originals, this is one swing disc you won't want to put down! Glamour, style, and tales of love shine through in every melody, beginning with "Things Are Looking Up." On your first listen you'll be instantly taken away by the realism of the music. So beautiful, it could definitely fit in with its predecessors -- during swing's first wave of popularity! On any following listening, though, you'll be taken back to the time when swing was popular -- back to the bars and all-night lindy hops -- and you'll start to envision what living in that time period was like. The song itself is a smooth lounge song with a punchy horn section to launch the song to the next level. As Craig's smooth vocals croon the optimistic lyrics, your mind will instantly be set on overdrive and you'll want to find that special someone to dance with. The song is just too romantic too ignore, both musically and lyrically. The complete package is presented here, and you'll enjoy every minute of it. "Swing Let's Swing" is a very appropriate title, because from the opening chant of "Swing, let's swing! Swing, let's swing" you'll begin to snap your fingers along with them. And before long, your whole body will be moving to the music. Silky smooth and equally glamorous, Craig's vocals seem to be the leading factor in the music. But the toe tappin' power of the drums also play a vital role. As does the cool breeze-gone-mad sound of the horns, which are able to melt your soul on one note, and on the next one get your heart fluttering. On "Just Lucky That Way," the band slows things down a bit. Led by soft drops of the piano, this is as romantic as it gets. You'll want to grab your loved one and hold them tightly, dancing along to the music as well as the lyrics. As the two of you move together, the warmth and love will flow from body to body. The music will be the conductor, and you'll embrace it. Spicing things up a bit, "Believe It Too" adds a little Latin heat to the mood. The percussion is flavorful, charting the course for the rest of the band. The horns are fluent and emotional, helping to seal in the flavors set by the percussion. The bass tingles with spirit, re-enforcing the rhythms of the drums. The guitar slides along effortlessly, but with so much livelihood. Then there is Craig Marshall. What can you say about this guy, except that he is smooth? He knows how to carry a tune, and does such a good job at it that you'll be wrapped up in everything he says. After listening to the Lucky Strikes, my life will never be the same. With SONG AND DANCE they definitely earn a spot at the top of the swing ladder. Personally, I never thought anyone would match Indigo Swing's intensity and passion, but these cats do a great job of it! Let's hear it for possibly the best swing band today (if not, they only fall short of Indigo Swing by a pinch). I'll give this disc an A+.